However this position is slowly changing, the digital revolution that is sweeping across all sectors in the economy has along its path dislodged traditional payment systems of debit and credit cards from their dominance of the market. At one point debit and credit cards, payment systems would carry the day bragging as the ‘fastest and most convenient’ payment system in the market. However this position is slowly changing, the digital revolution that is sweeping across all sectors in the economy has along its path dislodged traditional payment systems of debit and credit cards from their dominance of the market. Electronic wallets and mobile money are gaining popularity at the expense of debit and credit cards. However, cards have not lost it yet, here’s why your debit card is still useful for transactions. Whereas cards have developed acceptance as a means of payment across all types of stores and service points, electronic wallets are constrained by not being universally acceptable across all merchants. Different merchants accept varied wallets. Furthermore, cards are easier to use for the less tech savvy generation since all you need is the card and some form of identification. Electronic wallets on the other hand, require you to have a smart phone, an App installed and technical knowledge on how to navigate through the App. Electronic wallets offer the customer kickbacks such as cash backs which can only be used by certain vendors. Whereas for debit cards and credit cards, reward points earn the customer the same privileges. Additionally, for debit cards, monies are kept in the client’s savings account at the bank. These monies would normally attract an interest unlike monies in an online wallet which sits in an escrow account and is not eligible to earn interest. Digital wallets require a simple one-step authentication (mostly a password) for online transactions. A card would require a two-step authentication which provides more safety. As technology develops to make transactions easier, debit and credit cards are still use full as they provide all round access to your account, can be used at any ATM machine and across almost all retail and e-tail merchants. Debit cards are available with most bank accounts and normally don't require a credit review. 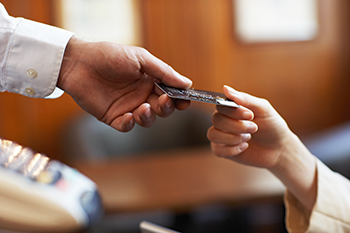 There is typically no extra charge to make a purchase with your debit card.